Two little words, but don't they convey a great depth of meaning? From whom does one expect miracles to come? Only from the Lord. He is the only one capable of performing miracles in our lives. Expect. . . the dictionary gives three definitions for this word. Regard (something) as likely to happen. Regard (someone) as likely to do or be something. Believe that (someone or something) will arrive soon. "a surprising and welcome event that is not explicable by natural or scientific laws and is therefore considered to be the work of a divine agency." This applies so well to our relationship with our Lord. If we live a life of trusting Him by faith, as we are called to do, we will live a life of expecting something to happen which others cannot explain. We will be living expecting miracles. By that I don't mean we will see visions or hear the Lord speaking to us audibly. What I do mean is that we will see Him meet our needs in ways we could have never explained in any way except by His hand. We will see His promises fulfilled in our lives in countless ways. We will be amazed at His workings as we expect and look for them in our lives. I heard a preacher make the statement, "God comes with the trouble." He was addressing the point that trouble is always around the corner in our lives, whether it be financial difficulties, health issues or troubles with relationships. It never seems to be perfect sailing in our lives. He went on to say that we can find great comfort in the fact that, for Christians, God always comes with the trouble. In fact, He precedes it. When the Israelites were wandering in the wilderness, the pillar of fire and the cloudy pillar led them by day and by night. God was with them in the wilderness. The manna fed them perfectly and their shoes never wore out because God was with them in the wilderness, He was with them in their trouble. As His children, we will never face a moment when He is not with us, indeed, when He is not within us. There is no trouble we will ever face alone. It is our enemy who whispers in our trouble that we are alone, but our Lord has promised just the opposite. Are you facing a trouble right now in which you feel all alone? Is there something weighting down your heart? Our Lord is there with you even now. He seeks to comfort, encourage and strengthen you. In fact, He called the Holy Spirit, which lives in you, the Comforter. and though the mountains be carried into the midst of the sea." God is our "very present help in trouble." You can't get much closer than residing in someone. That's the closest He could possible be. He is with us in every pain, every suffering, every trouble, every situation. Let us acknowledge His presence in our troubles very early that we may find Him to be our rock and our fortress, our deliverer, our God, our strength, our buckler and our high tower. Last Sunday, as we were leaving Sunday School, we noticed the baby of some friends of ours fast asleep in her car seat. I joked with her father, Steve, that I would love to sleep like that just for one night. "Yeah," he replied, "I'd like an adult sized car seat." I replied to him that it wasn't the car seat which caused her deep sleep, it was the fact she had nothing to worry about, all her needs were taken care of by her parents and her only requirements were to eat and sleep. Our heavenly Father would have us to be just as relaxed and peaceful as beautiful little Bethany. He would have us just as trusting in Him for all our needs as Bethany is in her earthly parents. Looking at our apparent needs, looking at the problems in our lives, or in the lives of others, looking at the turmoil in our world will only lead us to sink beneath the boisterous waves of life. We must continually be "Looking unto Jesus the author and finisher of our faith; who for the joy that was set before Him endured the cross, despising the shame, and is set down at the right hand of the throne of God." (Hebrews 12:2.) He is the author, He is the finisher and what He sets out to do, He always finishes. He is completely faithful and true. So whatever need you see in your life, you can completely trust Him with it. What ever need you see in the lives of those you love, He is worthy of the task. What ever need you see in our world, He is the only One able to truly deal with it. In fact, He is already working in all those areas to bring about His Father's eternal purpose. All our concerns are safe in His hands, because He cares for us. He is totally and completely worthy of our trust, so let us rest in Him. As my husband loves to say, "No one has ever trusted in the God and Father of our Lord Jesus and been disappointed in doing so." and in righteousness He doth judge and make war." There are some little things which can have a huge impact. Our smiles are one of these. Anytime we make facial expressions, whether we mean to or not, we are transmitting messages which are then interpreted by those who see us. Many who do not know us will form an impression of us based simply upon our expressions. I found this to be true at work. One morning, after an especially busy night, our boss stepped into the nurses' station. Her brow was furrowed and her lips were pursed. She clearly looked upset to me, but I suspected this wasn't actually the case. "You can't look at us like that after the night we've had," I said jokingly to her, "we can't take it." She was clearly surprised that she was communicating anything negative with her expression. "Oh, I didn't mean to look like that, I was just thinking," was her reply. Her facial expression had led me, and my colleagues, to immediately expect the worst, but thankfully we had misinterpreted the expression. Just the opposite is true of a young man whose name I don't even know, but I know his smile very well. He comes each night to pick up the trash from our unit. He pushes a cart much larger than he is and goes to the soiled utility room where he loads the bags of trash from that room into his cart. Each night when I see him I give him a big smile and say hello, and he does the same to me. Often when I am going to the pharmacy or to the Emergency Room to pick up a patient, I will see him pushing his cart from one unit to another. I have never seen him without the smile. I look forward to seeing him simply because his smile makes me smile. "A merry heart maketh a cheerful countenance: but by sorrow of the heart the spirit is broken." There are people the Lord has put in each of our paths who can benefit from a simple smile. It is such a little thing, but can do so much for those who see it. It can be a source of encouragement, it can lift a sad heart, it can be the beginning of a friendship. Our smile speaks of contentment, joy and love. It takes so very little to spread it to everyone we encounter and yet it can have such a big impact. Let us use this simple thing in our lives as a way to transmit the love of our Lord to others. We never know what door that one smile may open for us to share more, or how a simple smile can revive the heart of one facing grief, sadness or despair. Last weekend we had the pleasure of having our grandchildren, Jack and Emma, stay with us. I may be biased, but these are two of the sweetest, smartest and delightful children I have ever met. 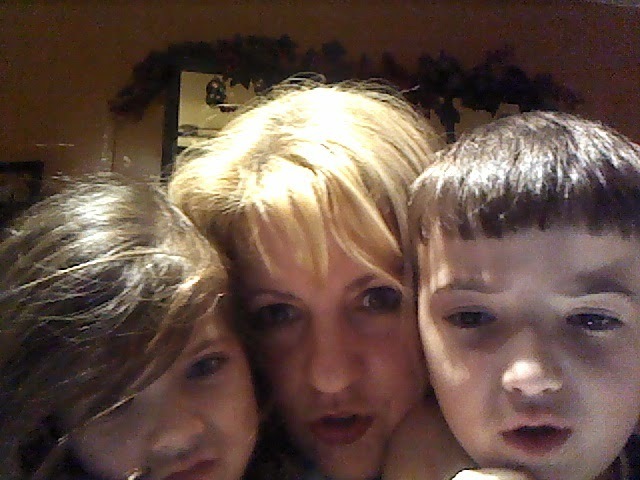 But then, I am their "Grannie Frannie." Jack and Emma rarely give us any trouble. Jack simply loves following the rules. His sister Emma, although fearless and adventuresome, follows them because she knows the consequences. It is an odd thing when we have to enact discipline with them. This past weekend was one of those odd times. I had been in the living room, while the children played under the supervision of their Aunt Marie. Things were quiet and calm, until some bickering started between Jack and Emma. This very shortly escalated into a fight. Marie was quick to intervene, suggesting they both needed some "time out." It has been so long since either of them had any "time out" neither of them would fit in the tiny preschool chair we used for that purpose. So I pulled two dining room chairs into the hall and made them face opposite walls for the appointed time (the average of their ages.) I warned them that they were not to move or to speak during that time. They were so still and quiet I wondered at one point if they were even breathing! "The hallmark of our family is respect and kindness. This is how we want to treat everyone. Anytime you are fighting with each other or someone else, it is because you are no longer being respectful or kind. In this family we seek to put everyone else's wants and needs before our own, to think of others as "better than themselves." If you are fighting, you are thinking that you are more important than the other person and that what you want is more important than what they want." I love the way I have heard one preacher say it, "the only Person who ever had any right to be proud, wasn't." If our Lord is the example of humility, then we are to walk in His steps and His attitudes. It shames me how often I have not followed that path, how often I have let my Greek-Irish temper flare in indignation. Clearly I was not esteeming others as better than myself in those times. Whenever pride, arrogance and indignation rise their ugly heads in our hearts and minds, let us remember the One who willingly humbled Himself, who gave up the glories of heaven to take upon Himself "the form of a servant." Let us fall to our knees to thank Him for His incredible sacrifice and to ask that He work that same humility in and through us as we trust Him by faith. The dictionary gives this definition of the word "trigger:"
"a small device that releases a spring or catch and so sets off a mechanism, especially in order to fire a gun." I find triggers quite useful. Not necessarily for firing a gun, but for firing prayers. I think if we polled the Christians we know about their prayer life, we would find that most would admit prayer is the most difficult and perhaps perplexing part of their walk with the Lord. The Apostle Paul encouraged us to "Pray without ceasing." (I Thessalonians 5:17.) It seems to me that praying without ceasing must be something done simply and easily if it is to be accomplished at all. If it necessitates a particular posture or formulation of phrases how could it ever be done once, much less done consistently? I find I need triggers to help me with prayer, especially consistent prayer. There are so many instances in our lives which can prompt us to prayer if we allow them. For example, whenever I hear a siren I have a group of individuals for whom I pray at that very instance. This includes my son, Noah, who is a deputy sheriff; Micah, a police officer and the son of a friend of ours; Micah's mother Pam, who like most mothers of those put themselves in harm's way, fears for the safety of her child. I also pray for a friend of ours, Sterling, who is a firefighter and EMT, and for Kristy a new EMT. These prayers are brief, sometimes simply, "Lord work in their lives where you see need." But would the prayer be any better for abundance of words? The Lord knows their lives, their hearts and their needs in reference to His eternal purpose in Christ Jesus. Whenever I see a school bus, I pray for our friend Karen who drives a school bus. When I see something red, I pray for my dear friend Peggy, whom I call my "red carrot sister," or as I prefer, "ma carotte rouge soeur" because doesn't everything sound better in French? Since my favorite color is red, there are abundant opportunities for these prayers. Times of pain and sickness are more excellent triggers for prayer. When we are hurting, instead of concentrating on our own pain, we can pray for our brothers and sisters in Christ who are hurting, both emotionally and physically. They may be people we know, or those we have never met, but the Lord knows them. I am quite positive that praying for others in our pain renders some of the sweetest fragrances to the Lord. Of course, prayer lists are good too, and I have those conveniently stored in the calendar of my phone. But I don't think the Lord intended for our prayers to be just one block of time, but a continual conversation with Him. I know if I only spoke to my husband once a day he would not be long in asking me what was wrong. If we are frequently engaging ourselves with the Lord throughout the day we will be more likely to walk in His paths than if prayer only happens in a "one and done" sort of manner. The most important thing about prayer is to realize how very dear our prayers are to the Lord. ". . .but the prayer of the upright is His delight." (Proverbs 15:8.) The Scriptures don't say He tolerates our prayers, or He enjoys them, but that our prayers are His delight. Let us seek ways and places and triggers to lift up our voice to the Lord throughout our day, bringing delight to His heart and encouragement, comfort and peace to our own. and watching thereunto with all perseverance and supplication for all saints;"
And if somehow you find delight in my prayers. And my voice You will hear.